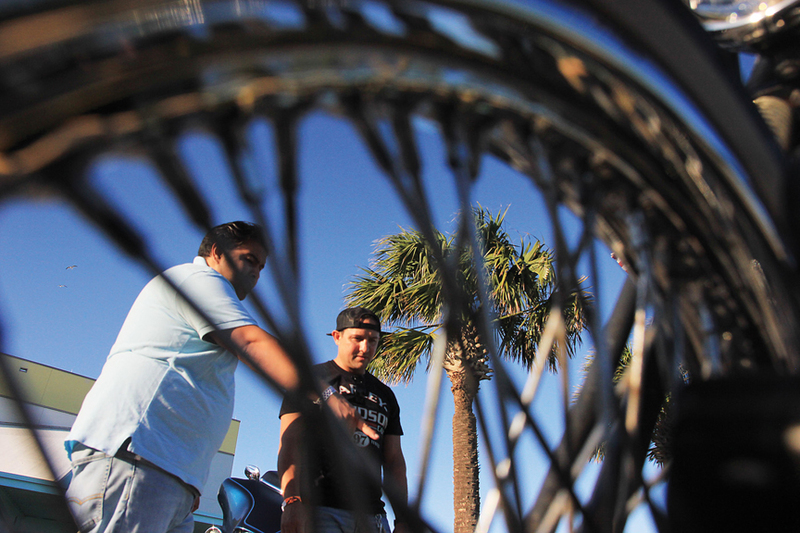 The overwhelming sentiment among the hundreds of motorcycle enthusiasts who flocked to South Padre Island last weekend was one of renewed welcome for the bike rally which had drawn them here. The SPI BikeFest, also known as “Roar by the Shore” returned in force after a nearly four year hiatus. The event, billed as one of the largest in South Texas, left the Island for Corpus Christi in 2013. Last week’s event marked not only a return to the Rio Grande Valley, but a change in season, too for the fest was previously held in the fall. The changes didn’t dissuade the bikers, though. By Thursday afternoon, bone-shaking rumbles could be heard emanating from the loud exhaust pipes of Harley Davidson cruisers rolling down the main drag in Port Isabel before they crossed the Queen Isabella Memorial Causeway towards the Island. “I’m glad it’s back,” Donna resident Eric Campbell said just outside the South Padre Island Convention Centre Friday afternoon. “It’s been a while since they’ve had it here,” he said. Campbell looked on as a vendor sampled some automotive wax on his bike, buffing the gas tank of his 1999 Harley Superglide to a mirror-like shine. A bike mechanic himself, he said he was excited to see how other riders have customized their bikes. Inside the Convention Centre, a couple clad in riding denim looked on as a vendor with nimble fingers worked to sew patches onto vests and jackets on an industrial sewing machine. “I have a veteran vest. I’ve been to Afghanistan, Iraq,” said Mission resident and U.S. Army veteran Ronnie Escobar. “I’m just getting a couple of veteran patches put on,” he said. Escobar and his wife, Christina, have been attending BikeFest since 2007, they said. Like Campbell, they were glad the event had returned to the Island. “I went to Corpus (Christi) one time and I didn’t like it,” Escobar said. “I’d rather it be here on the Island. It’s closer to home and everything is pretty much together,” he said. Further up the coast, the Fest’s events had been spread out, he said. Escobar’s wife joked that her favorite part of BikeFest was riding as a passenger with her husband. “I like to be the accessory on the bike,” she said with a laugh. The soft spoken Escobar shook his head ever so slightly, saying he encourages Christina to become a rider herself. Friday’s BikeFest crowds were slow to gather, but by Saturday, the Convention Centre parking lot glittered and gleamed as the bright afternoon sunlight glinted off hundreds of chrome wheels and pipes. Not far from the entrance, however, something unusual stood out amid the sea of mostly black and silver Harley cruisers. A bright spot of fire engine red and pale grey highlighted the classically-styled, yet aggressive riding lines of a café racer — a rare sight at BikeFest. 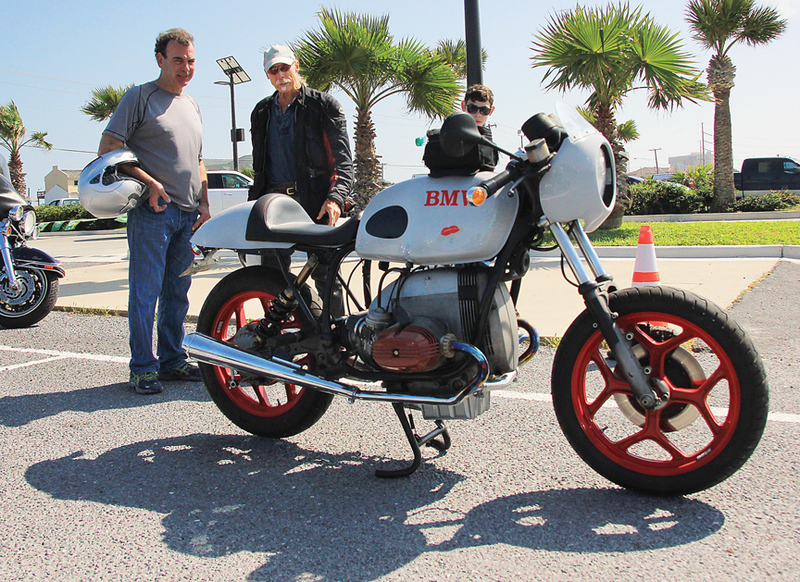 It was a customized 1986 BMW R65 owned by Larry Duvernell, a Winter Texan who originally hails from St. Louis. Duvernell, a spry 71-year-old Vietnam veteran, spoke of having attended BikeFest in the past, and of bringing something different each time. “Here’s the bottom line: everybody wants to show off their motorcycle and you’ve got to have something different if you’re going to show it off,” he said. “So, I come out here with an oddball, which is a German (BMW) R65. It does draw a lot of interest and it’s a fun bike,” he said. As Duvernell packed away his riding gear in a small bag which straddled the gas tank, several onlookers paused on their way towards the Convention Centre to admire his “oddball” bike. “It’s a fun day here at the Island,” he said.